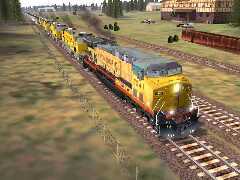 Coming into Cutbank in our Amtrak F40, two GP38 helpers are waiting for us. This page contains a some simple solutions that might make things easier for you when installing various locos and rolling stock. They don't deserve a whole page, such as aliasing does, so from time to time have a quick glance to see what I've added as time goes along. Columbia Falls yards from our GP38-2 cab. After installation and aliasing, there was no sound in the cab nor did any controls work. So it was off to WordPad to have a look at the cabview file, gp38J.cvf. When scrolling through this file, I noticed that double quotes did not enclose all the folder and file names for the ACE graphics files. So double quotes were inserted - there are a fair number so patience is needed. Another test in MSTS resulted in all working properly! Going back a couple of steps, after running the installer, I opened Explorer to check my GP38 subfolder under Common.Cab. To keep consistency, I decided to copy GP38J.cvf from CVF_Alias to GP38 (under Common.Cab). You'll see how this works in a step or two below. Note the bkp extension to avoid an over-zealous disk cleanup utility that deletes any files with extension bak. The next step was to copy the new GP38 ENGine file which the installer had placed in Extras to the main GP38 folder. Cabview ( gp38.cvf ), or similar. This is the format I have in all my ENGine files whenever aliasing and keeps me happy.  (14-Apr-02): As of this date, I'm trying to track down a bug which crashes MSTS on my machine when the headlight is switched on. I'm assuming an error is being caused by something in the EMD GP38 SMS sound file. 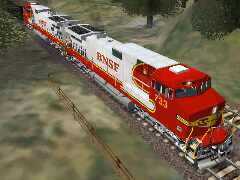 GE-9-44CW BNSF #733 and #4700 in the famous red/silver livery. The installer that I ran from f45cab.zip (3.3Mb, 05-Nov-01) had the default MSTS folder path D:\Program Files\Microsoft Games\Train Simulator\Trains\Trainset\. After taking some notice of what was going on after a couple of install failures, a simple change, in my case because I've got Program Files on my drive C:, to C:\Program Files\Microsoft Games\Train Simulator\Trains\Trainset\ and all went perfectly. When there's a big load, only big power can move it. Five UP AC6000CWs haul 12,000 tonnes past the Izaak Walton Inn at Essex. As part of the install of the NALW Gen_Paks, the AMD103 loco was deleted. However, when setting up to run an activity, MSTS gave that message "Missing ENG... \AMD103.eng". So to ConBuilder to see what could be done to stop MSTS' complaint. Presently ConBuilder, at version 1.4.9, can't do anything to replace missing rolling stock in loose consists, which is where the AMD103 is. A loose consist, by the way, is a number of locos or rolling stock that are set in a siding. The first instance of AMD103 is the name of the rolling stock (a loco in this case), obtained from the name of the ENG file, i.e., amd103.eng. MSTS expects to find this ENG file in the folder named, AMD103. Going down to the WagonData line, MSTS expects to find superliner.wag (because it's a wagon) in the folder called GENESIS. You'll see the same format used in a consist file so open one in WordPad to check. All we need do is change any reference to AMD103 to a loco we've got in our roundhouse. I simply changed the AMD103 loco reference to the GENESIS loco which is found in the GENESIS folder. You could use another loco if you want - just remember it's the loco's ENG file name first, followed by the name of the folder containing this particular loco. Note that you can now see why it's advisable to NOT use spaces in the names of folders for locos. Nor is it advisable to have spaces in the name of loco ENG files. When you want to space out the name of a loco (or any rolling stock) and its folder name, use the underscore character (_). For example, Dash9_CSX.eng in folder Dash9_CSX. Amtrak Empire Builder (Train 7) meets a freight on Marias Pass. We're in the cab of #18, clicking along at 73mph. While running the activity, Train 27, with a consist of 3 Amtrak P42s, 10 Superliner passenger coaches and 15 Amtrak Express boxcars, a certain amount of frustration came about when more than about 20% brake was applied. The system dumped all the air and then took about 5 minutes to recharge. The value set by NALW for each of their P42s works quite well with only 6 or 7 passenger cars, but with a consist as above on webWiz's "special" Empire Builder, the air brake recharge time was not practical. The worst occasion across Marias Pass when all the air was dumped after some heavy braking on the downgrade at Java West. Note that these values are completely unrealistic but until there's a patch to fix the track problem at Cutbank, there's no other way to avoid ripping our hair out everytime we get the dreaded message "Broken coupler - Activity terminated". Note that the e in the above values means to the power of 10 so effectively we've increased the coupler break force from 20 million Newtons to 51 million Newtons. There is one more step, namely to change the Break values for the Superliner coaches. webWiz has the Phase III Superliner coach set (each in its own folder, Phase3xxxxx) or you may just have the SuperCoach in SUPERCOACH. For each coach, open its WAG file (e.g., Supercoach.wag or PH3supersleeper.wag) and change the Break value as we did for the P42 locos. After this bit of work, you'll be able to get the Empire Builder safely from Shelby to Whitefish. If you want to check the Empire Builder, timetable, visit the Amtrak's Schedule page at www.trainweb.com/amtrak/.